Hello again from Sakai. June is traditionally the rainy season in Japan, but this year there has been almost no rain. While it is nice not to have to battle the rain when walking to the train station or carrying groceries home from the store, the cool rain before the long, hot summer was always refreshing. The last few months have been a time of great encouragement for us. Here is a quick update of what the Lord has been doing in Sakai. Thank you so much for your prayers for Luke. His new school year started in April, and although none of his three closest friends from last year are in his new class, Luke seems to be adjusting well and making friends. He still says that he wishes the other children could speak English, but we notice that he has recently been using Japanese words and phrases when playing with his friends. This has greatly helped to reduce his stress level (not to mention ours!) Thanks again for all of your prayers, e-mails, phone calls and encouraging words regarding Luke’s schooling. One of the biggest blessings of the last few months has been the new relationships that have developed with some of the families (mostly the mothers & kids) at Luke’s school. Chris has become good friends with a couple of the mothers which has not only been fun for Chris, but has also opened up new opportunities for evangelism. A few weeks ago we got together with a couple of families and took our kids to the zoo (see our homepage for pictures). We also invited a bunch of his classmates (and their mothers) to Luke’s birthday party and a couple of them have even come along to church. Chris is also attending an outreach bible study for the kindergarten mothers hosted by one of the few Christian parents in the school. Things have been going well at the church. We have recently had a lot of new visitors, some of whom seem to have found a home at SIBC. 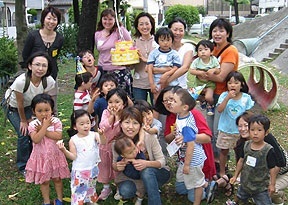 For example, there is a Japanese couple who recently returned from a stay in Germany,, and a Japanese mother and her two children who spent many years living in the States. The children really wanted to find an English-speaking Sunday school like they attended in America, so they have been coming to SIBC. Please pray that these new people would meet Jesus and make many new friends at SIBC. We mentioned in our last letter about a growing passion for prayer. Well, that passion continues to burn and there is a small group of people who are hungry for a genuine move of God at SIBC. Specifically, we are being provoked by the Lord’s Prayer, where Jesus tells us to pray “May your kingdom come, may your will be done on earth as it is in heaven.” God’s will is “heaven on earth.” This means that anything that is allowed in heaven is God’s will for earth, and anything that is not allowed in heaven is not God’s will on earth. This has challenged us to consider the magnitude of the simple prayer “Thy kingdom come.” As Jesus preached the word of God and demonstrated the power of God, he was taking a stand against the kingdom of darkness, so that his Father’s kingdom might be established here on earth. 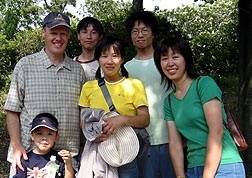 Please pray with us as we desire to see the kingdom of God and God’s heavenly will released upon the city of Sakai. To this end, we have a busy summer planned at the church. On July 18th we are having a special outreach event for the children. This is a national holiday in Japan (Ocean Day), so our event is called “Adventure Under the Sea.” This will be a time of storytelling, mime, puppets, games and songs for the children. Then, on August 2nd we are having a church BBQ. 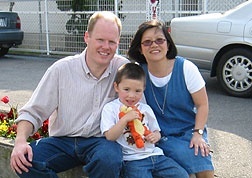 A short-term mission team from Cerritos Baptist Church in Los Angeles will be joining us. They will be teaching basketball to the kids and hula to anyone else. They will also be sharing their testimonies. We anticipate many non-church families to attend the event. Finally, on August 7th, the Holiness Youth Choir will be in town. We will be co-sponsoring an afternoon concert with our sister church in Osaka City. Please pray for these various summer events. May we build relationships with those who attend and may many people be drawn to our Lord Jesus Christ. Well, that’s about it for now. We know that we say this every time, but your partnership with us is absolutely vital to the work that the Lord is doing here. Thanks, again for all of your prayers and support. We greatly appreciate you.